E. F. Schumacher wrote of a sensibility, a paradigm, a worldview, in which human beings might exist in long-lived intimacy and harmony with the natural world. But for most of us that possibility remains a longing, an instinctual hope for a condition we have never known. 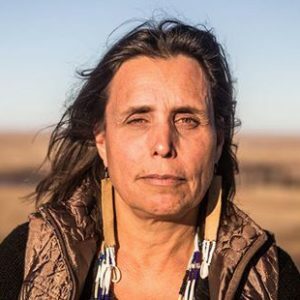 For Winona LaDuke it is a living heritage, the beleaguered but surviving belief system and chosen way of life of her people, the Mississippi band of Anishinaabeg of the White Earth Reservation in Northern Minnesota. Thank you for inviting me to come here and talk about some of the things that are important to the Anishinaabeg and to the wider community of native peoples. I am here to share some of our perspectives. I’ve read a lot of the writing by some of you in this room, and I really appreciate what you have to say. Thank you also for the work that you do. I’ve been to some of the places where you do these things, and you do a good job. In addition, I want to thank some of the students here. Kael Loftus and Matt Taylor and others really helped us a lot in our James Bay struggle. If you think that what you do doesn’t make a difference, I want to tell you that the students who worked on James Bay a couple of years ago–and some are still working on it–have made a big difference. I want to acknowledge all of you for the work you have done. Today I’d like to talk about keewaydahn, which means “going home” in the Anishinaabeg language. It’s something like what Wes Jackson said earlier in today’s program about the process of going home and finding home. I think that is essentially what we need to be talking about. It is a challenge that people of this society face in belonging to a settler culture. They have been raised in this land, but they do not know its ceremony, its song, or its naming. Early settlers re-used names from other places, calling their settlements “New England,” “New Haven,” and “New York.” But at the same time there are many indigenous names that co-exist with them. I think naming, as well as knowing why names are, is very important in restoring your relationship with the earth and finding your place. Restoring this relationship is our challenge. To introduce myself I’ll tell you a little bit about my work and about where I come from. I’m basically a community organizer, like a lot of you. I returned to the White Earth Reservation about ten years ago after being raised off-reservation, which is a common circumstance for our people. I then began to work on the land issue, trying to win back or buy back our reservation lands. In our community I am identified as Muckwuck or Bear clan, Mississippi band, Anishinaabeg. That’s my place in the universe. The headwaters of the Mississippi are on our reservation; where the river starts is where we are in the world. Anishinaabeg is our name for ourselves in our own language; it means “people.” We are called Ojibways in Canada and Chippewas in the United States. Our aboriginal territory, and where we live today, is in the northern part of five American states and the southern part of four Canadian provinces. It’s in the center of the continent and is called the Wild Rice Bowl or the Great Lakes region. Today we are probably the single largest native population in North America: there are at least two hundred and fifty thousand of us. We’re on both sides of the border, and most people don’t know who we are or know much about us. That ignorance stems in part from the way Americans are taught about native people. There are about seven hundred different native communities in North America. Roughly one hundred are Ojibway or Anishinaabeg communities, but we’re different bands. In Alaska there are two hundred native communities; in California there are eighty. In Washington state there are fourteen different kinds of Indian people living on the Yakima Reservation alone. All different kinds of indigenous people live in North America: all culturally and historically diverse. The same situation is found on a larger scale when you look at the entire continent, the Western Hemisphere, and the world. I want you to rethink the geography of North America in terms of cultural geography, in terms of land occupancy. Now, if you look at the United States, about 4 percent of the land is held by Indian people. That is the extent of today’s Indian reservations. The Southwest has the largest native population, and there’s a significant population on the Great Plains. In northern Minnesota there are seven big reservations, all Ojibway or Anishinaabeg. But if you go to Canada, about 85 percent of the population north of the fiftieth parallel is native. So if you look at it in terms of land occupancy and geography, in about two-thirds of Canada the majority of the population is native. I’m not even including Nunevat, which is an Inuit-controlled area the size of India in what used to be called the Northwest Territories. If you look at the whole of North America, you find that the majority of the population is native in about a third of the continent. Within this larger area indigenous people maintain their own ways of living and their cultural practices. This is our view of the continent, and it is different from the view of most other North Americans. When we look at the United States and Canada, we see our reservations and reserves as islands in the continent. When Indian people talk about their travels, they often mention reservations rather than cities: “I went to Rosebud, and then I went over to North Cheyenne.” This is the indigenous view of North America. Going beyond North America, I want to talk about the Western Hemisphere and the world from an indigenous perspective. My intent is to present you with an indigenous worldview and our perception of the world. There are a number of countries in the Western Hemisphere in which native peoples are the majority of the population: in Guatemala, Ecuador, Peru, Bolivia. In some South American countries we control as much as 22 to 40 percent of the land. Overall, the Western Hemisphere is not predominantly white. Indigenous people continue their ways of living based on generations and generations of knowledge and practice on the land. On a worldwide scale there are about five thousand nations. Nations are groups of indigenous peoples who share common language, culture, history, territory, and government institutions. That is how international law defines a nation. And that is who we are: nations of people who have existed for thousands of years. There are about a hundred and seventy–maybe more now, about a hundred and eighty-five–states that are recognized by the United Nations. For the most part, these states are the result of colonial empires or colonial demarcations. And whereas indigenous nations have existed for thousands of years, many of the states which exist in the world today have been around only since World War II. That is a big difference. Yet the dominant worldview of industrial society is determined by these young states, not by the five thousand ancient nations. The estimated number of indigenous people in the world depends on how you define indigenous people. It is said that there are currently about five hundred million of us in the world today, including such peoples as the Tibetans, the Masai, the Wara Wara, and the Quechua. I define indigenous peoples as those who have continued their way of living for thousands of years according to their original instructions. That is a quick background on indigenous people. It should help you understand that my perspective, the perspective of indigenous peoples, is entirely different from that of the dominant society in this country. Indigenous peoples believe fundamentally in natural law and a state of balance. We believe that all societies and cultural practices must exist in accordance with natural law in order to be sustainable. We also believe that cultural diversity is as essential as biological diversity to maintaining sustainable societies. Indigenous peoples have lived on earth sustainably for thousands of years, and I suggest to you that indigenous ways of living are the only sustainable ways of living. Because of that, I believe there is something to be learned from indigenous thinking and indigenous ways. I don’t think many of you would argue that industrial society is sustainable. I think that in two or three hundred years this society will be extinct because a society based on conquest cannot survive when there’s nothing left to conquer. Indigenous people have taken great care to fashion their societies in accordance with natural law, which is the highest law. It is superior to the laws made by nations, states, and municipalities. It is the law to which we are all accountable. There are no Twelve Commandments of natural law, but there are some things which I believe to be true about natural law. And this is my experience from listening to a lot of our older people. What I am telling you is not really my opinion; it’s based on what has happened in our community, on what I’ve heard people say, and on their knowledge. We have noticed that much in nature is cyclical: the movements of moons, the tides, the seasons, our bodies. Time itself, in most indigenous worldviews, is cyclical. We also have experienced and believe that it is our essential nature and our need always to keep a balance in nature. Most indigenous ceremonies, if you look to their essence, are about the restoration of balance. That is our intent: to restore, and then to retain, balance. Nature itself continually tries to balance, to equalize. According to our way of living and our way of looking at the world, most of the world is animate. This is reflected in our language, Anishinabemowin, in which most nouns are animate. Mandamin, the word for corn, is animate; mitig, the word for tree, is animate; so is the word for rice, manomin, and the word for rock or stone, asin. Looking at the world and seeing that most things are alive, we have come to believe, based on this perception, that they have spirit. They have standing on their own. Therefore, when I harvest wild rice on our reservation up north, I always offer asemah, tobacco, because when you take something, you must always give thanks to its spirit for giving itself to you, for it has a choice whether to give itself to you or not. In our cultural practice, for instance, it is not because of skill that a hunter can harvest a deer or a caribou; it is because he or she has been honorable and has given asemah. That is how you are able to harvest, not because you are a good hunter but because the animal gives itself to you. That is our perception. And so we are always very careful when we harvest. Anthropologists call this reciprocity, which means something anthropological, I guess. But from our perspective it means that when you take, you always give. This is about balance and equalness. We also say that when you take, you must take only what you need and leave the rest. Because if you take more than you need, that means you are greedy. You have brought about imbalance, you have been selfish. To do this in our community is a very big disgrace. It is a violation of natural law, and it leaves you with no guarantee that you will be able to continue harvesting. We have a word in our language which describes the practice of living in harmony with natural law: minobimaatisiiwin. This word describes how you live your life according to natural law, how you behave as an individual in relationship with other individuals and in relationship with the land and all the things which are animate on the land. Minobimaatisiiwin is our cultural practice; it is what you strive toward as an individual as well as collectively as a society. We have tried to retain this way of living and this way of thinking in spite of all that has happened to us over the centuries. I believe we do retain most of these practices to a great extent in many of our societies. In our community they are overshadowed at times by industrialism, but they still exist. I would like to contrast what I’ve told you about indigenous thinking with what I call “industrial thinking.” I think the Lakota have the best term to describe it. It actually refers to white people, although they are not the only ones who think this way. Indigenous peoples have interesting terms for white people: they are usually not just words, they are descriptions encapsulated in a word. I will tell you about one: the Lakota word for a white person is wasichu. It derives from the first time the Lakota ever saw a white person. There was a white man out on the prairie in the Black Hills, and he was starving. He came into a Lakota camp in the middle of the night, and the Lakota of course were astonished to see him. They began to watch him to see what he was doing. He went over to the food, took something, and ran away. A little while later, the Lakota looked to see what he had taken: he had stolen a large amount of fat. So the Lakota word for a white person, wasichu, means “he who steals the fat.” Now, that is a description which doesn’t necessarily have to do with white people, but taking more than you need has to do with industrial society. He who steals the fat. That’s what I’m talking about when I refer to the industrial worldview. Industrial thinking is characterized by several ideas which run counter to indigenous ideas. First, instead of believing that natural law is preeminent, industrial society believes that humans are entitled to full dominion over nature. It believes that man–and it is usually man of course–has some God-given right to all that is around him, that he has been created superior to the rest. Second, instead of modeling itself on the cyclical structure of nature, this society is patterned on linear thinking. I went all the way through its school system, and I remember how time, for example, is taught in this society. It’s taught on a timeline, usually one that begins around 1492. It has some dates on it that were important to someone, although I could never figure out to whom. The timeline is a clear representation of this society’s linear way of thinking. And certain values permeate this way of thinking, such as the concept of progress. Industrial society wants to keep making progress as it moves down the timeline, progress defined by things like technological advancement and economic growth. This value accompanies linear thinking. Third, there is the attitude toward what is wild as opposed to what is cultivated or “tame.” This society believes it must tame the wilderness. It also believes in the superiority of civilized over primitive peoples, a belief which also follows a linear model: that somehow, over time, people will become more civilized. Also related, of course, is the idea behind colonialism: that some people have the right to civilize other people. My experience is that people who are viewed as “primitive” are generally people of color, and people who are viewed as “civilized” are those of European descent. This prejudice still permeates industrial society and in fact even permeates “progressive” thinking. It holds that somehow people of European descent are smarter and they have some better knowledge of the world than the rest of us. I suggest that this is perhaps a racist worldview, that it has racist implications. That is, in fact, our experience. Fourth, industrial society speaks a language of inanimate nouns. Even words for the land are becoming inanimate. Jerry Mander discusses this idea in The Absence of the Sacred when he talks about the “commodification of the sacred.” Industrial language has changed things from being animate, alive, and having spirit to being inanimate, mere objects, and commodities of society. When things are inanimate, “man” can view them as his God-given right. He can take them, commodify them, and manipulate them in society. This behavior is also related to the linear way of thinking. Fifth, the last aspect of industrial thinking I’m going to talk about is the idea of capitalism itself (although it’s always unpopular to question it in America). In this country we are taught that capitalism is a system which combines labor, capital, and resources for the purpose of accumulation. The capitalist goal is to use the least labor, capital, and resources to accumulate the most profit. The intent of capitalism is accumulation. So the capitalist’s method is always to take more than is needed. Therefore, from an indigenous point of view capitalism is inherently out of harmony with natural law. Based on this goal of accumulation, industrial society practices conspicuous consumption. Indigenous societies, on the other hand, practice what I would call “conspicuous distribution.” We focus on the potlatch, the giveaway, an event which carries much more honor than accumulation does. In fact, the more you give away, the greater your honor. We make a great deal of these giveaways, and industrial society has something to learn from them. Over the past five hundred years the indigenous experience has been one of conflict between the indigenous and the industrial worldviews. This conflict has manifested itself as holocaust. That is our experience. Indigenous people understand clearly that this society, which has caused the extinction of more species in the past hundred and fifty years than the total species extinction from the Ice Age to the mid-nineteenth century, is the same society that has caused the extinction of about two thousand different indigenous peoples in the Western Hemisphere alone. We understand intimately the relationship between extinction of species and extinction of peoples, because we experience both. And the extinction continues. Just last year the Bureau of Indian Affairs, which has legal responsibility for people like myself–legally, I’m a ward of the federal government–declared nineteen different indigenous nations in North America extinct. The rate of extinction in the Amazon rainforest, for example, has been one indigenous people per year since 1900. And if you look at world maps showing cultural and biological distribution, you find that where there is the most cultural diversity, there too is the most biological diversity. A direct relationship exists between the two. That is why we argue that cultural diversity is as important to a sustainable global society as biological diversity. Our greatest problem with all of this in America is that there has been no recognition of the cultural extinction, no owning up to it, no atonement for what happened, no education about it. When I ask people how many different kinds of Indians they can identify, they can name scarcely any. America’s mythology is based on the denial of the native–of native humanity, even of native existence. Nobody admits that the holocaust took place. This is because the white settlers believed they had a God-given right to the continent, and anyone with this right wouldn’t recognize what happened as holocaust. Yet it was a holocaust of unparalleled proportions: Bartholomew de las Casas and other contemporaries of Columbus estimated that fifty million indigenous people in the Western Hemi- sphere perished in a sixty-year period. In terms of millions of people, this was probably the largest holocaust in world history. Now, it is not appropriate for me to say that my holocaust was worse than someone else’s. But it is absolutely correct for me to demand that my holocaust be recognized. And that has not happened in America. Instead, nobody knows anything about the native people, not even educated people. Why? Because this system is based on a denial of our existence. We are erased from the public consciousness because if you have no victim, you have no crime. As I said, most Americans can hardly name a single Indian nation. Those who can are able to name only those that have been featured in TV Westerns: Comanche, Cheyenne, Navajo, Sioux, Crow. The only image of a native that is widely recognized in this society is the one shown in Westerns, which is a caricature. It is a portrayal created in Hollywood or in cartoons or more recently to a minimal degree in “New Age” paraphernalia. In this society we do not exist as full human beings with human rights, with the same rights to self-determination, to dignity, and to land–to territorial integrity–that other people have. The challenge that people of conscience in this country face is to undo and debunk the mythology, to come clean, become honest, understand the validity of our demands, and recognize our demands. People must see the interlocking interests between their own ability to survive and indigenous peoples’ continuing cultural sustainability. Indigenous peoples have lived sustainably in this land for thousands of years. I am absolutely sure that our societies could live without yours, but I’m not so sure that your society can continue to live without ours. This is why indigenous people need to be recognized now and included in the discussion of the issues affecting this country’s future. I’d like to tell you now about indigenous peoples’ efforts to protect our land and restore our communities. All across this continent there are native peoples–in small communities with populations of one hundred, five hundred, even five thousand–who are trying to regain control of their community and their territory. I could tell you many stories of these different struggles, but I’ll use my own community as an example. Here is our story. The White Earth Reservation, located at the headwaters of the Mississippi, is thirty-six by thirty-six miles square, which is about 837,000 acres. It is very good land. A treaty reserved it for our people in 1867 in return for relinquishing a much larger area of northern Minnesota. Of all our territory we chose this land for its richness and diversity. There are forty-seven lakes on the reservation. There’s maple sugar, there are hardwoods, and there are all the different medicine plants my people use–our reservation is called “the medicine chest of the Ojibways.” We have wild rice, we have deer, we have beaver, we have fish–every food we need. On the eastern part of the reservation there are stands of white pine. On the part farthest west there used to be buffalo, but this area is now farmland, situated in the Red River Valley. That is our area, the land reserved to us under treaty. Our traditional forms of land use and ownership are similar to those of a community land trust. The land is owned collectively, and we have individual or, more often, family-based usufruct rights: each family has traditional areas where it fishes and hunts. In our language the words Anishinaabeg akiing describe the concept of land ownership. They translate as “the land of the people,” which doesn’t imply that we own our land but that we belong on it. Our definition doesn’t stand up well in court, unfortunately, because this country’s legal system upholds the concept of private property. Our community enforces its traditional practices by adhering to minobimaatisiiwin. Historically, this involved punishing people who transgressed these rules. For instance, in our community the worst punishment historically–we didn’t have jails–was banishment. That still exists in our community to a certain extent. Just imagine if the worst punishment in industrial society was banishment! With us, each person wants to be part of the community. We have also maintained our practices by means of careful management and observation. For example, we have “hunting bosses” and “rice chiefs,” who make sure that resources are used sustainably in each region. Hunting bosses oversee trap-line rotation, a system by which people trap in an area for two years and then move to a different area to let the land rest. Rice chiefs coordinate wild rice harvesting. The rice on each lake is unique: each has its own taste and ripens at its own time. We also have a “tallyman,” who makes sure there are enough animals for each family in a given area. If a family can’t sustain itself, the tallyman moves them to a new place where animals are more plentiful. These practices are sustainable. My children’s grandfather, who is a trapper, lives on wild animals in the wintertime. When he intends to trap beavers, he reaches his hand into a beaver house and counts how many beavers are in there. (Beavers are not carnivorous, they won’t bite.) By counting, he knows how many beavers he can take. Of course, he has to count only if he hasn’t already been observing that beaver house for a long time. This is a very sustainable way to trap, one based on a kind of thorough observation which can come only with residency. Further, I suggest that this man knows more about his ecosystem than any Ph.D. scholar who studies it from the university. As I have indicated, the White Earth Reservation is a rich place. And it is our experience that industrial society is not content to leave other peoples’ riches alone. Wealth attracts colonialism: the more a native people has, the more colonizers are apt to covet that wealth and take it away, whether it is gold or, as in our case, pine stands and Red River Valley farmland. A Latin American scholar named Eduardo Galeano has written about colonialism in communities like mine. He says: “In the colonial to neo-colonial alchemy, gold changes to scrap metal and food to poison. We have become painfully aware of the mortality of wealth, which nature bestows and imperialism appropriates.” For us, our wealth was the source of our poverty: industrial society could not leave us be. Our reservation was created by treaty in 1867; in 1887 the General Allotment Act was passed on the national level, not only to teach Indians the concept of private property but also to facilitate the removal of more land from Indian Nations. The federal government divided our reservation into eighty-acre parcels of land and allotted each parcel to an individual Indian, hoping that through this change we would somehow become yeoman farmers, adopt the notion of progress, and become civilized. But the allotment system had no connection to our traditional land tenure patterns. In our society a person harvested rice in one place, trapped in another place, got medicines in a third place, and picked berries in a fourth. These locations depended on the ecosystem; they were not necessarily contiguous. But the government said to each Indian, “Here are your eighty acres; this is where you’ll live.” Then, after each Indian had received an allotment, the rest of the land was declared “surplus” and given to white people to homestead. On our reservation almost the entire land base was allotted except for some pinelands that were annexed by the state of Minnesota and sold to timber companies. What happened to my reservation happened to reservations all across the country. The federal government was legally responsible for this; they turned our land into individual eighty-acre parcels, and then they looked the other way and let the state of Minnesota take some of our land and tax what was left. When the Indians couldn’t pay the taxes, the state confiscated the land. How could these people pay taxes? In 1900 or 1910 they could not read or write English. I’ll tell you a story about how my great-grandma was cheated by a loan shark. She lived on Many-Point Lake, where her allotment was. She had a bill at the local store, the Fairbanks grocery store, and she had run it up because she was waiting until fall when she could get some money from trapping or from a treaty annuity. So she went to a land speculator named Lucky Waller, and she said, “I need to pay this bill.” She asked to borrow fifty bucks from him until treaty payment time, and he said: “Okay, you can do that. Just sign here and I’ll loan you that fifty bucks.” So she signed with her thumbprint and went back to her house on Many-Point Lake. About three months later she was ready to repay him the fifty bucks, and the loan shark said: “No, you keep that money. I bought land from you instead.” He had purchased her eighty acres on Many-Point Lake for fifty bucks. Today that location is a Boy Scout camp. This story could be retold again and again in our communities. It is a story of land speculation, greed, and unconscionable contracts, and it exemplifies the process by which native peoples were dispossessed of their land. The White Earth Reservation lost two hundred and fifty thousand acres to the state of Minnesota because of unpaid taxes. And this was done to native peoples across the country: on a national average reservations lost a full two- thirds of their land this way. By 1920, 99 percent of original White Earth Reservation lands was in non-Indian hands. By 1930 many of our people had died from tuberculosis and other diseases, and half of our remaining population lived off-reservation. Three generations of our people were forced into poverty, were forced off our land and made refugees in this society. Now a lot of our people live in Minneapolis. Of twenty thousand tribal members only four or five thousand live on reservation. That’s because we’re refugees, not unlike other people in this society. Our struggle is to get our land back. That’s what we’ve been trying to do for a hundred years. By 1980, 93 percent of our reservation was still held by non-Indians. That’s the circumstance we are in today. We have exhausted all legal recourse for getting back our land. If you look at the legal system in this country, you will find that it is based on the idea that Christians have a God-given right to dispossess heathens of their land. This attitude goes back to a papal bull of the fifteenth or sixteenth century declaring that Christians have a superior right to land over heathens. The implication for native people is that we have no legal right to our land in the United States or in Canada. The only legal recourse we have in the United States is the Indian Claims Commission, which pays you for land; it doesn’t return land to you. It compensates you at the 1910 market value for land that was seized. The Black Hills Settlement is one example; it’s lauded as a big settlement, with all this money going to the Indians, but it’s only a hundred and six million dollars for five states. That’s the full legal recourse for Indian people. In the case of our own reservation we had the same problem. The Supreme Court ruled that to regain their land Indian people had to have filed a lawsuit within seven years of the original time of taking. Now, legally we are all people who are wards of the federal government. I have a federal enrollment number. Anything having to do with the internal matters of Indian governments is subject to the approval of the Secretary of the Interior. So the federal government, which is legally responsible for our land, watched its mismanagement and did not file any lawsuits on our behalf. The Courts are now declaring that the statute of limitations has expired for the Indian people, who, when their land was taken, could not read or write English, had no money or access to attorneys to file suit, and were the legal wards of the state. We have therefore, the courts claim, exhausted our legal recourse and have no legal standing in the court system. That is what has happened in this country with regard to Indian land issues. We have fought federal legislation for a decade without success. Yet we look at the situation on our reservation and realize that we must get our land back. We do not really have any other place to go. That’s why we started the White Earth Land Recovery Project. The federal, state, and county governments are the largest landholders on the reservation. It is good land still, rich in many things; however, when you do not control your land, you do not control your destiny. That’s our experience. What has happened is that two-thirds of the deer taken on our reservation are taken by non-Indians, mostly by sports hunters from Minneapolis. In the Tamarac National Wildlife Refuge nine times as many deer are taken by non-Indians as by Indians because that’s where sports hunters from Minneapolis come to hunt. Ninety percent of the fish taken on our reservation is taken by white people, and most of them are taken by people from Minneapolis who come to their summer cabins and fish on our reservation. Each year in our region about ten thousand acres are being clear-cut for paper and pulp in one county alone, mostly by the Potlatch Timber Company. We are watching the destruction of our ecosystem and the theft of our resources; in not controlling our land we are unable to control what is happening to our ecosystem. So we are struggling to regain control through the White Earth Land Recovery Project. Our project is like several other projects in Indian communities. We are not trying to displace people who have settled there. A third of our land is held by the federal, state, and county governments. That land should just be returned to us. It certainly would not displace anyone. And then we have to ask the question about absentee land ownership. It is an ethical question which should be asked in this country. A third of the privately held land on our reservation is held by absentee landholders who do not see that land, do not know it, do not even know where it is. We ask these people how they feel about owning land on a reservation, hoping we can persuade them to return it. Our project also acquires land. It owns about nine hundred acres right now. We bought some land as a site for a roundhouse, a building that holds one of our ceremonial drums. We bought back our burial grounds, which were on private land, because we believe that we should hold the land our ancestors lived on. These are all small parcels of land. We also just bought a farm, a fifty-eight-acre organic raspberry farm. In a couple of years we hope to get past the “You Pick” stage into jam production. It is a very slow process, but our strategy is based on this recovery of the land and also on the recovery of our cultural and economic practices. We are a poor community. People look at our reservation and comment on the 85 percent unemployment–they do not realize what we do with our time. They have no way of valuing our cultural practices. For instance, 85 percent of our people hunt, taking at least one or two deer annually, probably in violation of federal game laws; 75 percent of our people hunt for small game and geese; 50 percent of our people fish by net; 50 percent of our people sugarbush and garden on our reservation. About the same percentage harvest wild rice, not just for themselves; they harvest it to sell. About half of our people produce handcrafts. There is no way to quantify this in America. It is called the “invisible economy” or the “domestic economy.” Society views us as unemployed Indians who need wage jobs. That is not how we view ourselves. Our work is about strengthening and restoring our traditional economy. I have seen our people trained and retrained for off-reservation jobs that do not exist. I don’t know how many Indians have gone through three or four carpenter and plumber training programs. It doesn’t do any good, if after the third or fourth time you still don’t have a job. Our strategy is to strengthen our own traditional economy, thereby strengthening our traditional culture as well, so that we can produce 50 percent or more of our own food independently, and can eventually produce enough surplus to sell. In our case most of our surplus is in wild rice. We are rich in terms of wild rice. The Creator, Gitchi Manitu, gave us wild rice–said we should eat it, said we should share it; we have traded it for thousands of years. A lot of our political struggle is, I am absolutely sure, due to the fact that Gitchi Manitu did not give wild rice to Uncle Ben to grow in California. Commercial wild rice is totally different from the rice we harvest, and it decreases the value of our rice when marketed as authentic wild rice. We’ve been working for several years now to increase the price of the rice we gather from fifty cents per pound to a dollar per pound, green. We are trying to market our rice ourselves. We try to capture the “value added” in our community by selling it ourselves. We went from about five thousand pounds of production on our reservation to about fifty thousand pounds last year. This is our strategy for economic recovery. Other parts of our strategy include language immersion programs to restore our language and the revival of drum ceremonies to restore our cultural practices. These are part of an integrated restoration process that is focused on the full human being. In the larger picture, in Wisconsin and Minnesota our community is working hard to exercise specific treaty rights. Under the 1847 treaty we have reserved-use rights to a much larger area than just our reservations. These are called extra-territorial treaty rights. We didn’t say we were going to live there, we only said we wanted to keep the right to use that land in our usual and accustomed ways. This has led us to a larger political strategy, for although our harvesting practices are sustainable, they require an almost pristine ecosystem in order to take as much fish and grow as much rice as we need. To achieve this, the tribes are entering into a co-management agreement in northern Wisconsin and northern Minnesota to prevent further environmental degradation as a first step toward preserving an extra-territorial area in accordance with treaty rights. There are many similar stories all across North America. A lot can be learned from these stories, and we can share a great deal in terms of your strategies and what you’re trying to do in your own communities. I see this as a relationship among people who share common issues, common ground, and common agendas. It is absolutely crucial, however, that our struggle for territorial integrity as well as economic and political control of our lands not be regarded as a threat by this society. Deep-set in settler minds I know there’s fear of the Indian having control. I’ve seen it on my own reservation: white people who live there are deathly afraid of our gaining control over half our land base, which is all we’re trying to do. I’m sure they are afraid we will treat them as badly as they have treated us. I ask you to shake off your fear, because there’s something valuable to be learned from our experiences, from the James Bay hydroelectric project in Quebec, for example, and from the Shoshone sisters in Nevada fighting the missile siting. Our stories are about people with a great deal of tenacity and courage, people who have been resisting for centuries. We are sure that if we do not resist, we will not survive. Our resistance will guarantee our children a future. In our society we think ahead to the seventh generation; however, we know that the ability of the seventh generation to sustain itself will be dependent on our ability to resist now. Another important consideration is that traditional ecological knowledge is unheard knowledge in this country’s institutions. Nor is it something an anthropologist can extract by mere research. Traditional ecological knowledge is passed from generation to generation; it is not an appropriate subject for a Ph.D. dissertation. We who live by this knowledge have the intellectual property rights to it, and we have the right to tell our stories ourselves. There is a lot to be learned from our knowledge, but you need us in order to learn it, whether it is the story of my children’s grandfather reaching his hand into that beaver house or of the Haida up on the Northwest coast, who make totem poles and plank houses. The Haida say they can take a plank off a tree and still leave the tree standing. If Weyerhaeuser could do that, I might listen to them, but they cannot. Traditional ecological knowledge is absolutely essential for the future. Crafting a relationship between us is absolutely essential. Native people are not quite at the table in the environmental movement–for example, in the management of the Great Plains. Environmental groups and state governors sat down and talked about how to manage the Great Plains, and nobody asked the Indians to come to the table. Nobody even noticed that there are about fifty million acres of Indian land out there in the middle of the Great Plains, land that according to history and law has never yet had a drink of water–that is, reservations have been denied water all these years because of water diversion projects. When water allocations are being discussed, someone needs to talk about how the tribes need a drink. One proposal for the Great Plains is a Buffalo Commons, which would include 110 prairie counties that are now financially bankrupt and are continuing to lose people. The intent is to restore these lands ecologically, bringing back the buffalo and bringing back the perennial crops and indigenous prairie grasses that Wes Jackson is experimenting with at the Land Institute in Salina, Kansas. We need to broaden the idea, though, because I don’t think it should be just a Buffalo Commons; it should be an Indigenous Commons. If you look at the present population in the area, you’ll find that the majority are indigenous peoples who already hold at least fifty million acres of the land. We know this land of our ancestors, and we should rightly be part of a sustainable future for it. Another thing I want to touch upon is the necessity of shifting our perception. There is no such thing as sustainable development. Community is the only thing in my experience that is sustainable. We all need to be involved in building sustainable communities. We can each do that in our own way–whether it is European-American communities or Dené communities or Anishinaabeg communities–returning to and restoring the way of life that is based on the land. To achieve this restoration we need to reintegrate with cultural traditions informed by the land. That is something I don’t know how to tell you to do, but it is something you’re going to need to do. Garrett Hardin and others are saying that the only way you can manage a commons is if you share enough cultural experiences and cultural values so that you can keep your practices in order and in check: minobimaatisiiwin. The reason we have remained sustainable for all these centuries is that we are cohesive communities. A common set of values is needed to live together sustainably on the land. Finally, I believe the issues deep in this society that need to be addressed are structural issues. This is a society which continues to consume too much of the world’s resources. You know, when you consume this much in resources, it means constant intervention in other peoples’ land and other peoples’ countries, whether it is mine or whether it is the Crees’ up in James Bay or whether it is someone else’s. It is meaningless to talk about human rights unless you talk about consumption. And that’s a structural change we all need to address. It is clear that in order for native communities to live, the dominant society must change, because if this society continues in the direction it is going, our reservations and our way of life will continue to bear the consequences. This society has to be changed! We have to be able to put aside its cultural baggage, which is industrial baggage. Do not be afraid of discarding it. It’s not sustainable. That’s the only way we’re going to make peace between the settler and the native. Miigwech. I want to thank you for your time. Keewaydahn. It’s our way home.